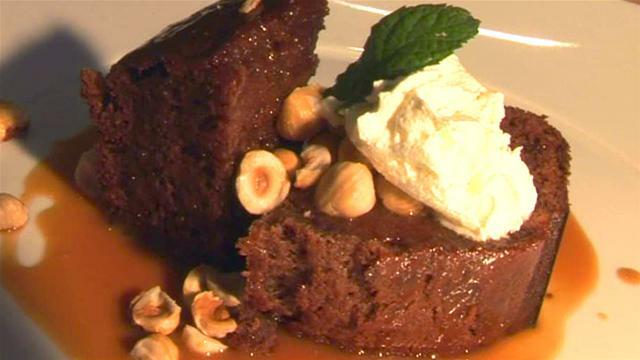 We had sticky toffee pudding recently at Peli Peli in Houston, TX. What a treat! They served it as a large cupcake topped with caramel sauce and heavy cream. It was so rich, but I think a scoop of vanilla ice cream would have been better than the cream. The cupcake was hot inside and seemed like a cross between gingerbread and carrot cake in texture and flavor. Yum. We shared one serving between the four of us and it was the perfect ending to the meal. Our meal was good, but the star of the show was definitely the sticky toffee pudding. We were treated to the meal by friends, but if we were going back on our own I’d just have the sticky toffee pudding. The coffee there left a lot to be desired. What a shame, as a good cup of coffee would have complimented this dessert so well. I found a recipe for it on AllRecipes that has a lot of stars. 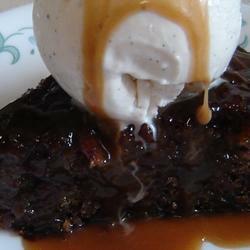 I read that sticky toffee pudding is Johnny Depp’s favorite dessert, if you need a reason to try it. It seems like a great dessert for the cooler months, but I couldn’t resist putting this up now. It’s sooooooo good. I like the idea of making this in a bundt cake pan, but baking it in a cupcake pan could be good too. If you use cupcakes, serve each one upside down. Try to serve the cake right from the oven to keep it hot. Give this treat a try, and remember it has zero calories! This could be very nice for a cool night on the deck while watching the stars.